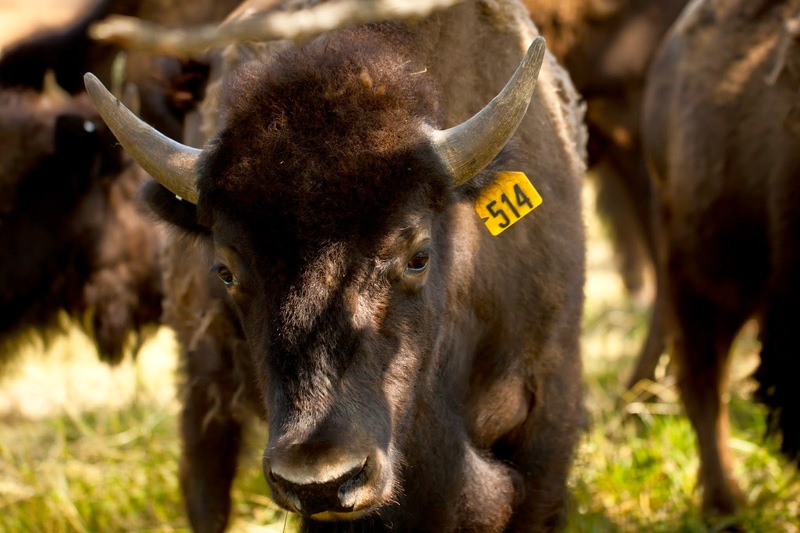 News, stories and updates about life on our Southern Missouri Bison Ranch & Hunting Retreat. I believe an introduction on here is in order! We've had some additions to the ranch lately that haven't been shared here on the blog. For those of you who follow us on Facebook, Twitter and Instagram, you will have seen our pictures of the fall calves coming in. These calves aren't our usual cinnamon colored bison calves though. 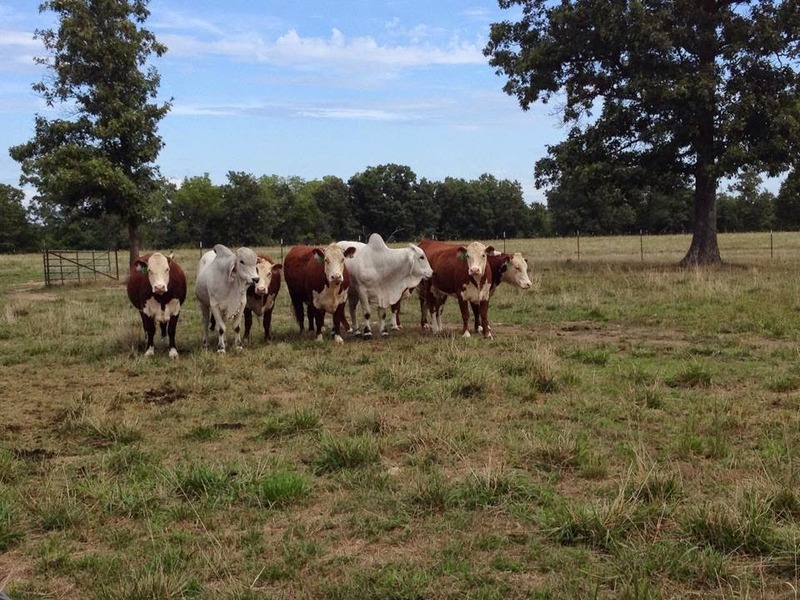 We have decided to enter the realm of grass fed beef with a herd of purebred Hereford cows from the Journagan Ranch. Our recent addition consists of 38 head of Hereford cows, 31 of which were bred to calve this fall. 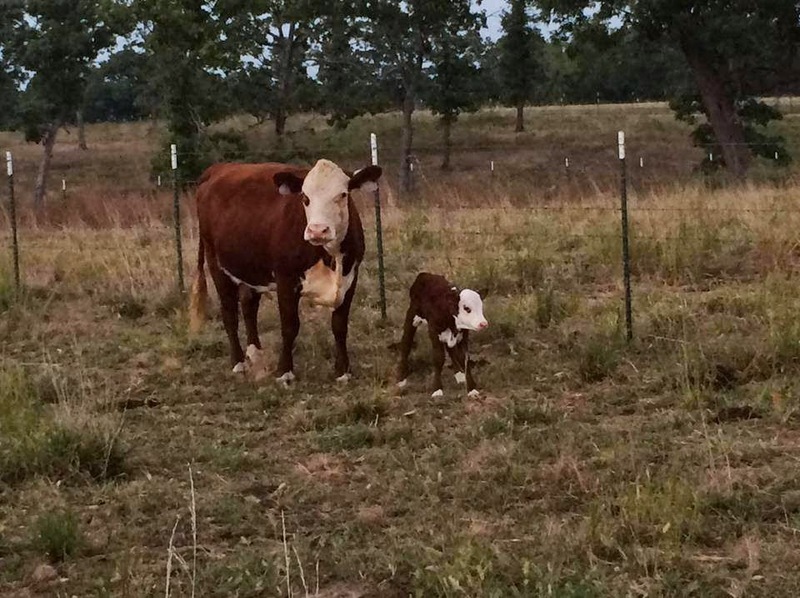 This season they will calve out purebred Hereford calves as you have seen from our social media pictures, but next year they will be bred to our two Brahman bulls. Now someone may ask "Why take a pure bred Hereford only to breed it with a Brahman?" Well the answer lies in the genetics of these two cattle breeds as I'll elaborate. A Hereford cow with her calf. Hereford cattle have long been bred as an outstanding meat breed. 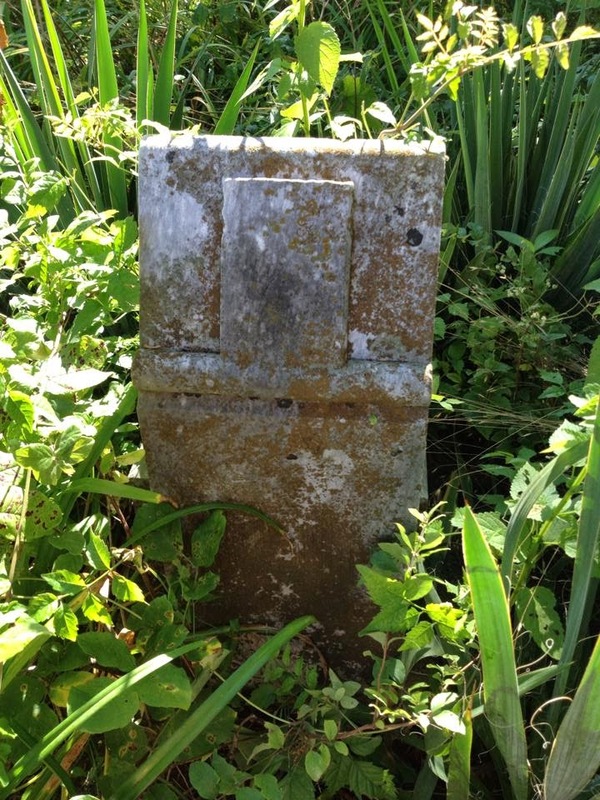 Their lineage dates back to the 18th and 19th century. They were originally bred in Herefordshire southern England for use as a dual purpose beast of burden and superior beef animal. The breed was originally brought into the United States as long ago as 1817. Thanks to the traits selected for this breed they muscle very well for meat production and tend to be easy breeders, as well as easy calvers; on the down side though, they aren't as well adapted to heat stress being initially from England, and they also have a predisposition to cancer eye. 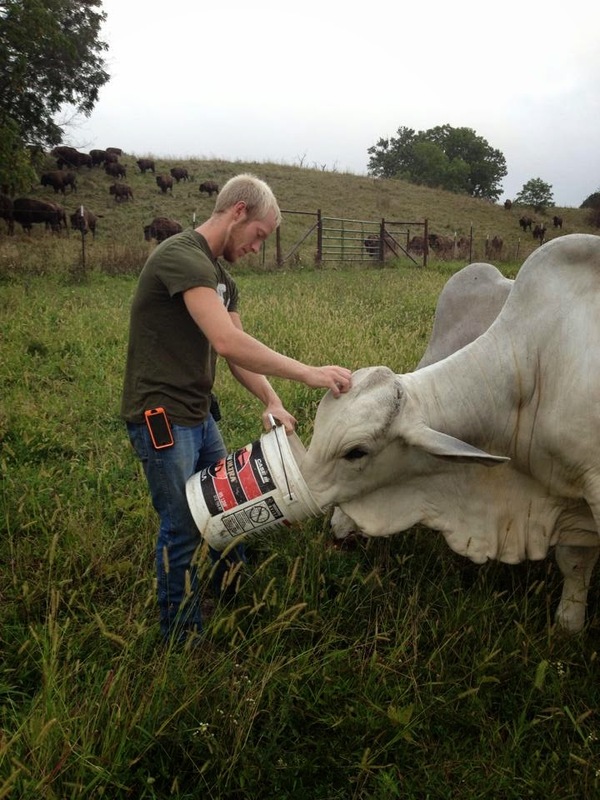 Caleb feeding a Brahman bull. 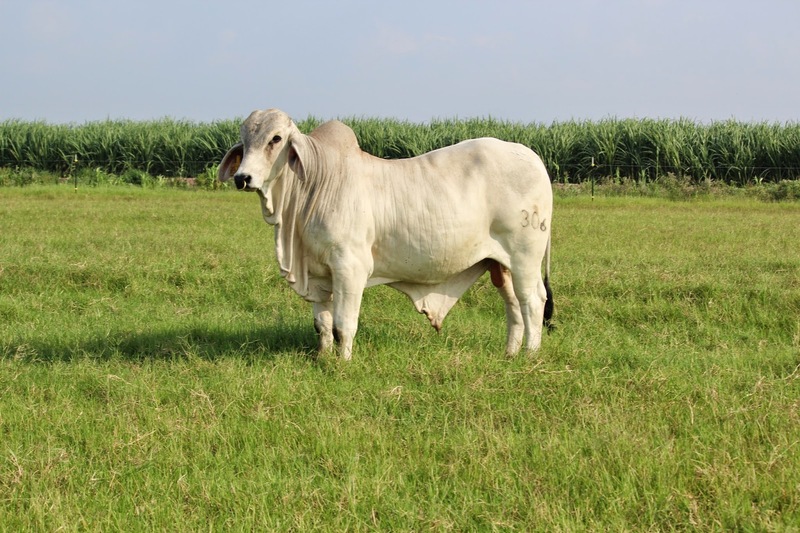 Brahman cattle are also a breed that was imported to the United States long ago with the first cattle being brought in in the late 1800's. The story on them gets a little more interesting though as they were a very difficult breed to import being as they are considered a sacred breed in the Hindu religion. The animals brought in actually consisted of four different breeds of Indian cattle with the vast majority of them being bulls. With these animals being bulls, most were bred to the European base meat breeds raised in the south. After five generations of breeding back though your breeding stock can be returned to a base of (31/32) pure, thereby showing the characteristics initially brought here. 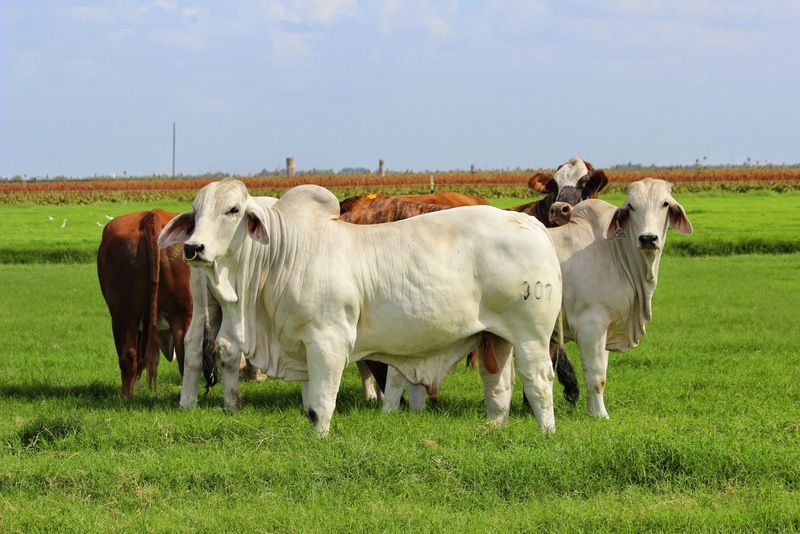 The benefits of the Brahman breed are perfect for creating a solid genetic base in grass fed beef. They sweat whereas the European don't, thereby along with their pendulous skin allows them to comfortably withstand heat above 105F whereas most cattle show losses in production over 75F. Brahmans also have a low birth weight with a fast rate of gain and don't generally have issues with cancer eye. What this leads us to is the basis of Hybrid Vigor. When one breed is bred for a certain set of traits for an extended period of time other traits often become depressed. Hybrid vigor takes two breeds with both their great traits and bad traits and combines them to create a cross that often exemplifies the best of both breeds while diminishing or completely replacing the flaws bred into either parent breed. This is what we are achieving by breeding the Brahman bulls to our Hereford cows. We wind up with a calf that has a low birth weight but grows quickly and efficiently on grass, tolerates higher temperatures, resists parasites better and has low incidences of cancer eye. The colors created also are a plus as when these two breeds are crossed we get what is known as a "tiger stripe" as shown in the picture. With all of these traits we hope to be able to provide our customers with a superior grass fed beef product in the years to come. Fall is almost upon us! You may not notice it just yet, but leaves are beginning to turn colors and the air has a touch of chill to it. And maybe it's just me, but I think that the fall season has its own smell it brings with it too! Fall (or autumn, whichever you prefer) is my favorite time of year. Fall means sweaters and scarves and apple cider, gorgeous fall colors, pumpkins and great horseback riding weather! Fall is also the perfect time of year to come visit Miller Bison at Elkhead Ranch. 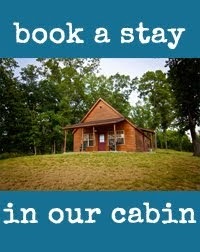 The cabin at Miller Bison at Elkhead Ranch sits on top of the highest hill on the property - and you'll really appreciate the great view you'll have of the beautiful fall colors in the Ozarks! You can sit on the porch with a cup of hot coffee (or cider - personally I would choose cider!) and admire the amazing scenery. 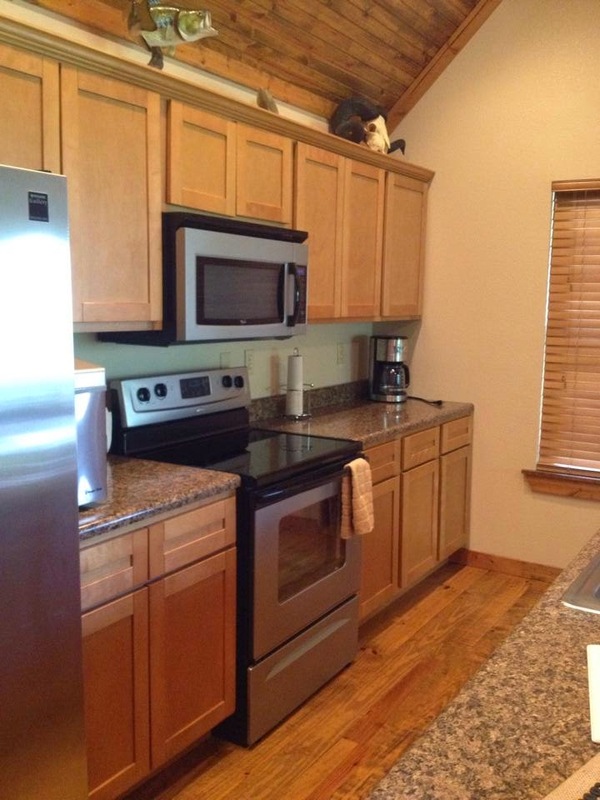 Our cozy cabin features a fully equipped kitchen, and our guests have the option of adding a bison meat package to their stay - so if it's too cold to venture outside, stay in and cook a hearty fall meal! Bison chili, anyone? Miller Bison at Elkhead Ranch features a beautiful hiking trail that cuts through the heart of the acreage we've dedicated to wildlife conservation. Autumn is a great time to hike since the weather is cooler. Plus, the animals on the trail tend to be a little more active! 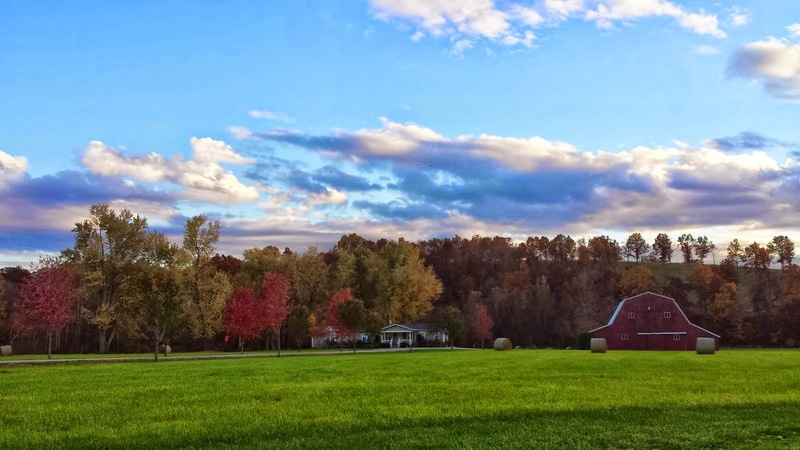 On your fall hike, you can see our hunting stands and food plots, an old homestead site, a historic cemetery, and of course, have an opportunity to see fall color at its best! Just because it's cooler doesn't mean the fish aren't biting – fall is a great time to sit on the dock at Elkhead Lake and cast a line! 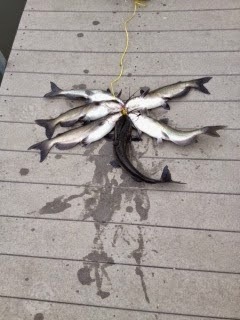 Our five acre, thirty foot deep lake is fully stocked with catfish, bass and more for your fishing pleasure. Miller Bison at Elkhead Ranch is full of panoramic autumn views, and the one off the fishing dock is spectacular! The best part of our ranch is the bison that call it home - and fall is a great time to come see them! We offer bison herd tours where you, your family or your field trip group can get up close and personal with these great American icons. Be sure to bring a camera with you – the stunning fall colors in the background make for some nice bison photo opportunities! 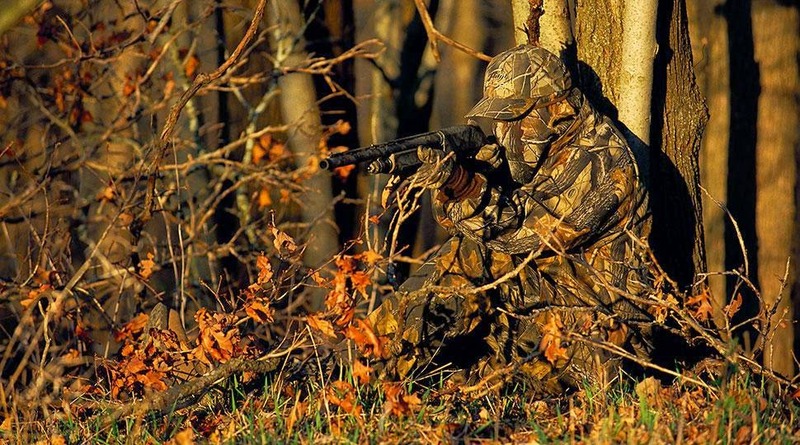 If you are familiar with hunting at all, chances are you know that hunters wear camouflage. 'Camouflage,' by definition, means 1. "the disguising of military personnel, equipment, and installations by painting or covering them to make them blend in with their surroundings" and 2. "to hide or disguise the presence of (a person, animal, or object) by means of camouflage." 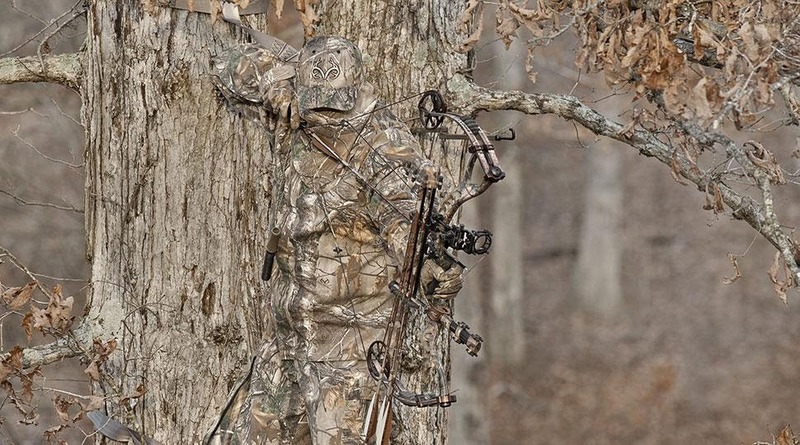 While the military and the hunting industry have perfected camouflage as a useful tool, the patterns known as camo have become popular fashion statements as well. You see it everywhere - on clothing, on vehicles, backpacks, OtterBoxes; you name it, it probably comes in camo. I myself am guilty of the camo craze, and I have the sweatshirt, bedspread and seat covers to prove it! So with all this camo out there, what should you be wearing for the upcoming hunting season? Here are a few of the most popular choices. Realtree Xtra: Realtree Xtra Camo is a 3D pattern that is designed to effectivley blend into forested surroundings in fall, winter, and early spring. With 12 natural colors integrated into the pattern, the deer won't be able to see you coming! Your hunting gear will be studded with large trees, small twigs and an assortment of leaves to help you blend in. 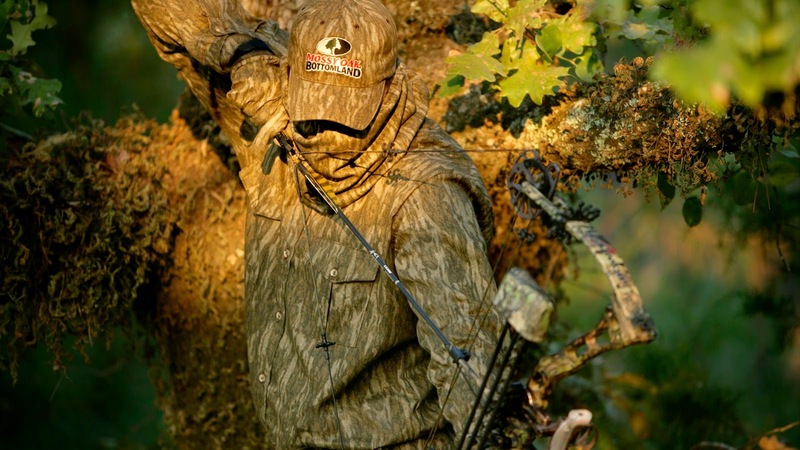 Realtree Hardwoods HD: Realtree Hardwoods HD Camo is a versatile season and region camo. 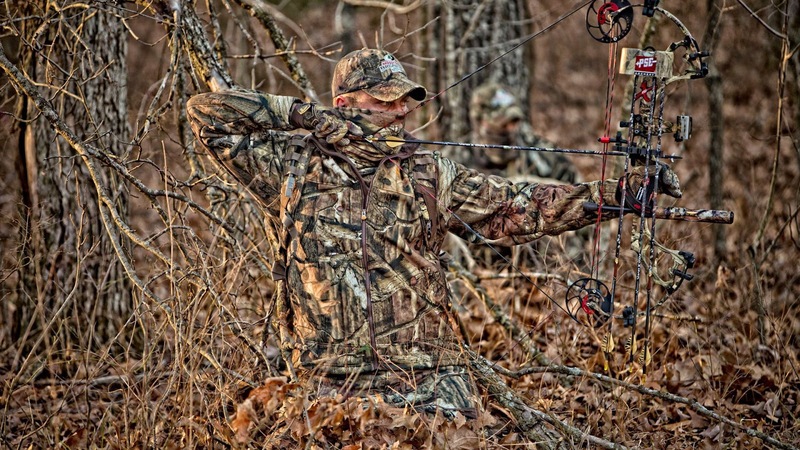 This pattern is designed to effectively make the visible edges of the hunter disappear into the woods. You will be outfitted with perfectly colored timber to disguise your hunting spot even in the dead of winter! Mossy Oak Break-Up Infinity: Using real images from the woods, Mossy Oak Break-Up Infinity is a camo with true depth to really break up (hence the name) the outline of the hunter wearing it. This pattern features realism and contrast, and you will certainly match the woods when you wear Mossy Oak's acorns, leaves and tree limbs! Mossy Oak Bottomland: Mossy Oak Bottomland is the company's first and original camo pattern - they call it 'The Foundation of Concealment.' This subtle pattern, still featuring the original look but with newer technology, it helps a hunter blend into darker environments. Your outfit will have some nice tones of dirt and bark added to it with this pattern! This is a very small glimpse at all of the different camo patterns out there - you won't have any trouble finding one that suits your hunting style - or your fashion flair! Happy hiding! Ferdinand and Eeyore: New additions to the Miller Bison at Elkhead Ranch family! Even though Ferdinand and Eeyore are full brothers, each bull has his own distinct personality. Ferdinand was named by my grandsons because one of their favorite books is Ferdinand the Bull. Ferdinand will let you stand and scratch his poll, rub his ears and wiggle the many folds of skin under his chin. He was hauled around the US going to Brahman Shows and is halter broke, so he is very tame and easy to handle. He has the 'England Brahman Bulls' brand on his right hip, and #307 on his left hip. He is so gentle, I wouldn't even hesitate letting our grandchildren pet him! Eeyore also has his own unique personality. He is much like the Winnie the Pooh character he is named after; a bit shy with long, drooping ears. When he first arrived at the ranch, he would stand away from me when I fed Ferdinand from my bucket. But, slowly, he has begun to trust me. Today, I can scratch his poll and pet him on the head. He is still a bit shy around new people, however. He is much more comfortable with only 1 person in the corral at a time. He, too, has the England brand on his right hip, with his #306 on his left hip. I think he is going to be a darker gray color than Ferdinand. He has already become darker around his hump and neck, since he has been here. You might be wondering why these Brahman bulls were purchased. Well, it is simple. They are going to be the 'husbands' to our Hereford cows. The cross between a Brahman bull and a Hereford cow produces what is called an F-1 Tiger Stripe. These Tiger Stripes (we have 6 cows on the ranch- see pictures below) are easy 'calvers', easy keepers, and don't mind the heat. There is a good market for the Tiger Striped calves, especially the heifers. The Tiger Striped phenotype is recessive. Therefore, the 'tiger-striped' look will not be produced from F-1 Tiger Stripes. In other words, the Tiger Striped cows you see below will NEVER produce a Tiger Striped calf. That is why we have chosen to cross the Registered Hereford cows (our choice for the cows) x Registered Brahman bull. The cow in the first picture below has the phenotype we are striving to produce in our calves from the Hereford and Brahman bull cross. F-1 Tiger Striped cows on the ranch, currently. The latest pictures of Ferdinand and Eeyore enjoying their breakfast. I can't wait to see the first calves that these big boys produce. They will be turned out with a few open Hereford cows very soon. So, the first babies F-1 Tiger Striped babies should arrive sometime in June, 2015. The female calves will be Golden Certified with the American Brahman Breeders Association. I will be anxious to share pictures of these new babies when they arrive!!! September is almost here - I’m not certain what that means to you, but here it means deer season is on the horizon. September 15th opens up Missouri Archery whitetail season which lasts till January 15th with only a 10 day break for rifle season (which runs from November 15-25). With just under a month to go until the first big deer season of the year, we have been doing everything we can to make your odds of getting big buck that much better here on our ranch! We are a fair chase hunting retreat when it comes to deer and turkey, so there are no guarantees but that’s what makes it fun! A soybean food plot just outside one of our hunting blinds. Here on the ranch we have planted acre after acre of soybean and clover food plots to grow our deer as big as we can and some of these guys on our trail cams are showing it! We have over 50 acres of dedicated wildlife food plots that we manage and plant to up your odds of bringing down your very own Ozarks trophy with either a bow, rifle, or crossbow. We also set out mineral blocks to guarantee that those guys are getting all that they need to grow those big ole racks you’ll be looking for on your hunt here. We have 7 cameras out facing our mineral blocks in the food plots so that we can place you right where the big guys are at this season. No matter which stand you sit in, every one of the cameras promises the potential for an awesome harvest. Even with several deer in velvet and still growing, we are getting pictures of 8s and 10s out there. Our stand options include two deluxe hunting blinds about 10 feet in the air with sliding windows and swivel barber chairs, or one of several two seater ladder stands. Whichever you hunt out of is completely up to your preference. To book a deer, turkey or even a bison hunt with us, visit our website, shoot us an email or simply give us a call at 1-417-683-6888. We would love to hear from you- or even better, set you up with a great trophy this season! 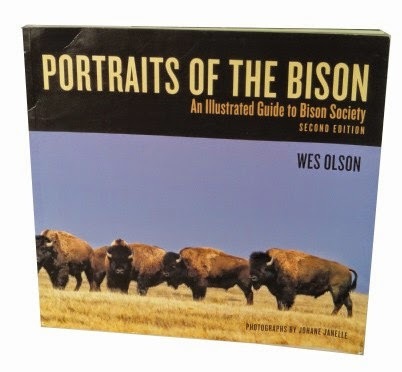 During the National Bison Association Conference earlier this summer, Caleb and I purchased a book that was written by Canada's leading bison expert, Wes Olson, called Portraits of the Bison. As the summer went on, we found ourselves frequently referring to this book, since it contained lots of pictures and information on the animals we care for on a daily basis. It's a great book for bison and nature enthusiasts alike! Check out my review below. This beautiful book about the North American Bison features one of the biggest bison photo collections in print. The full color photos by Johane Janelle of these amazing animals, accompanied by Wes Olson's eloquent writing style, really draw you into the world of bison societies. Chapter 1 tells the story of the bison saga: from plentiful roaming herds to near extinction to the conservation of bison in today's world. Chapter 2 goes into detail about safety and awareness when being around bison – whether you own a herd, or just happen to stumble upon a lone bull while hiking through Yellowstone. Olson offers sound wisdom on being aware of a bison's 'bubble,' and how to look for signs like pawing and head tossing to tell when an agitated animal might charge. Chapter 3 discusses the seasonal structure of bison herds and provides the reader with a glimpse of what it's like to be a bison in the spring when bison cows abandon their yearlings to attend to new calves, or during the summer, when breeding season can draw hundreds of bison together. Chapter 4 features photos and drawings of male and female bison at different stages in their lives so that the reader can learn to identify the age and gender of bison at a glance. Bison lovers and naturalists of all kinds are sure to enjoy this informative book! It is written in such a way that people who may not be very familiar with bison can understand the material, through drawings, diagrams, descriptive language, and of course, plenty of photographs, while still being entertaining and enjoyable for the more seasoned bison folks out there. The part of the book that engaged me the most were the drawings by Wes Olson. The details of them, along with the descriptive captions and diagrams indicating each part of the animal, were fascinating to someone who can't draw! Wes has a way of bringing the animals on the pages to life with each stroke of the pen. Being fairly new to the bison industry, I found Portraits of the Bison to be a wealth of information, especially when it came to telling the gender of our summer calf crop. The book taught me to look for a smooth underbelly on heifer calves, and to look closely for little round buttons that indicate a calf is a bull. With the drawings from the book as a guide, I'm now fairly confident in my observation skills! Portraits of the Bison can be purchased through the National Bison Association for $39.95. Really, really, good. 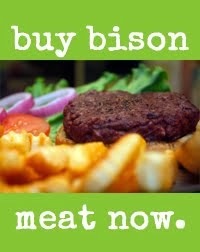 Before coming to work at Miller Bison at Elkhead Ranch, I had little to no experience with eating bison meat. In fact, I just assumed it was an elitist Montana tourist food. But then I ate some. And I haven't eaten beef since.